BOSTON, MA — Near freezing temperatures were simply not enough to keep faithful fans from seeing two of the biggest names in the world of dancehall/reggae music. As the great Selectah Junior Rodigan spun timeless records from a reggae consciousness old and new, hundreds gathered at The Roxy Nightclub on Wednesday, January 16 to see international reggae sensations I-Wayne and Wayne Wonder. The artists were in town to jumpstart the first of an 18-city U.S., tour. “I’m so hyped right now—this is my first show and I love I-Wayne,” said Nicole Harris of Roxbury, as many ecstatic fans rushed to position themselves by the stage at the opening performance. Another person anxious to start the show was actually I-Wayne’s friend and artist, Fire Star, who served as the opening act. “Well, this is the first show, so we just want to keep the fire blazing and turn it up even more, you know,” said the fledgling artist. Hailing from the rough area of Portmore, Jamaica (home to many of the island’s top artists, such as Anthony B, Vybez Kartel and I-Wayne), Fire Star delivered a commanding set with strong delivery and enlightening lyrics. The screams of female fans were a constant throughout the performance, as many sang and squirmed amongst themselves to get the singer’s attention. As his set closed, many a daring female fan hustled their way backstage with photographers and reporters in hopes of scoring a picture with their beloved artist. The night proved far from over as the sensual crooner Wayne Wonder made his way to the stage. The crowd exhibited an unbelievable degree of energy to the sweet sounds of the 15-year dancehall veteran. 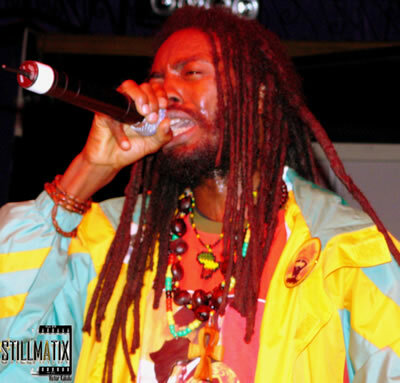 Legions sang along word for word as one of Kingston , Jamaica’s most decorated sons ran through various selections from his extensive catalogue. Fans met the single, For My Love featuring rapper Trina from the latest album Foreva, favorably, as it’s hard to find error in someone with longevity like Wayne Wonder. Yet, it was the singer’s classic records that lifted the audience to new heights again and again. Screams of, “I LOVE YOU WAYNE,” (along with many more suggestive propositions) were just a few of the comments hurled from the crowd as the opening to No Letting Go, the crooner’s 2003 hit which peaked at Number 11 on Billboard charts, began. Well aware of his fans’ affinity to his selections, the artist paused momentarily throughout each song, allowing people to sing word for word without interruption. Yet, while music is essential to the soul, none other than the dance itself characterizes a proper dancehall. Backed by a live band, the artist showed everyone he could still ‘buss di dance’ during a brief but entertaining bridge in his performance. The entertainment industry has become crippled since the advent of the internet and file sharing technology; shortening the lifespan of various would be entertainers. Yet, Wayne Wonder continues to stand as a jewel in an exclusive class of entertainers. While success is the objective of everyone, many fall short along the way in their quest to achieve longevity.